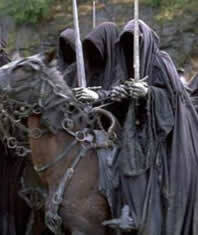 This is a depiction of the famous for horsemen of the Apocalypse, War, Famine Plague, and Death. 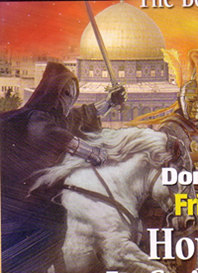 But the picture really looks a lot more like War, Famine, Plague, and a Nazgul. Look at the guy on the left. His buddies are all in Roman costume, with the crown of olive leaves around Plague's head, and the Roman blade in War's hand. But Death? Pure frikkin' Peter Jackson's Lord of the Rings. Nice way to hide your inspiration, Mr. Anonymous artist.